The raucous George Parker points us to news about Keith Richards, who told British magazine NME that he mixed the ashes of his father in blow and snorted it. There's this South Park episode where Cartman mistakes Kenny's ashes for chocolate milk mix and drinks him. For the rest of the episode he spiritually channels him and suffers flashbacks of Kenny's last memories. 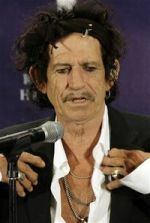 We doubt Keith Richards is channeling his pops, but he might be manifesting his would-be age. We feel an almost mythological fear of him. UPDATE: a reader does some homework and learns Richards was jesting. Small relief. This "news" is more like South Park than you think. Richards was kidding.